So I had some extra material from my work bench project and I wanted something to have near my work. So I built this simple table. 1/2" thick top with 250 lb casters that lock. That's cool. So is that color one of the mopar sublimes? 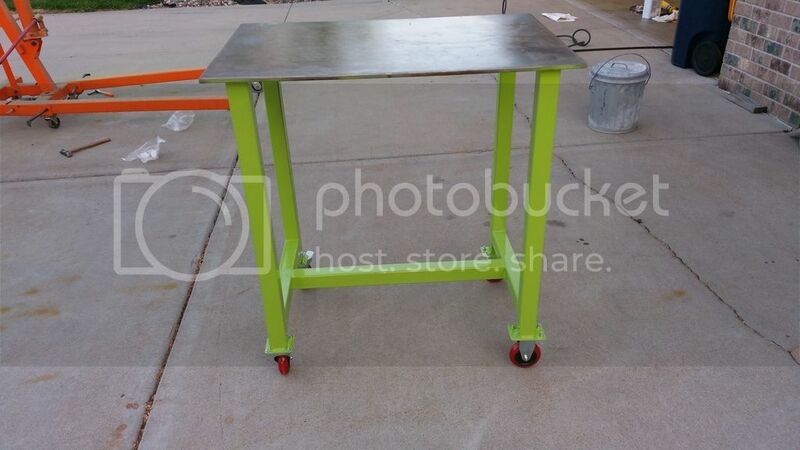 Nice table, I need to build me something similar to that but with bigger casters. Anyone know where to get some good quality steel caster to replace the cheap worn out ones on a engine hoist ? Nice job. That will come in handy. That is nice, great job. Pretty cool and handy I'm sure! How did you mount the top to the legs? Welded? Ship mine in Hemi Orange, THANKS! speedy...My coworkers saw my design so we made 5 of them at various heights. Mine is tall standing at 38.5 " . Perfect height to work without needing to bend over. I also moved the frame in 2" so there is a lip all the way around. This allows me to use a clamp if I need to hold my work. Good idea on the height and the 2" edge for clamps. One of these would be a great auction item at CF? I don't know it's pretty heavy.